I was born on July 22nd, 1989 at a Baltimore area hospital. I was born with a cleft palate, cleft lip, and a heart condition called Tetralogy of Fallot. My parents were referred to Hopkins because they could treat my heart condition much better than my birth hospital. 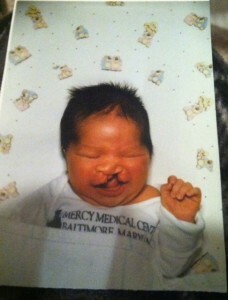 Upon arriving to Hopkins, they were told that I would have to have my cleft lip and palate repaired at three months old. They were also told that at six months old, I would have to have open heart surgery. As you can imagine, they were devastated, but remained hopeful. They’ve told me the open heart surgery day was the hardest day of their lives. Even though the team at Hopkins knew what they were doing, as parents you still fear the worst. My mom recalls not wanting to sign the pre-surgery release, in case I didn’t make it. My dad didn’t want to either, but someone had to. Hours later, I emerged from surgery pink as can be. Due to my heart condition, I would go pale. Previously I even turned blue. If it weren’t for Hopkins, I wouldn’t be alive today. They provide so many life saving programs, and so much support for patients and family alike. My ailments, even though scary, pale in comparison to some of the cases that walk through their door each year. Kids with cancer and other life threatening diseases need our support every single day. We’re SO lucky to have Hopkins here right in our backyards.